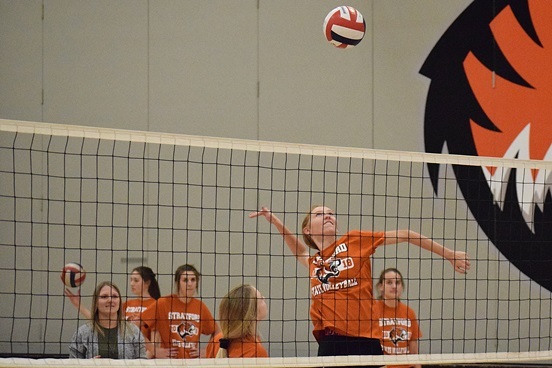 STRATFORD – The Stratford volleyball team has been dominant all season, rolling to a perfect 43-0 record and into the state tournament for a second-straight season. The Tigers will take on Living Word Lutheran (29-6) in a Division 3 semifinal at the 2018 WIAA State Girls Volleyball Tournament at Resch Center in Green Bay at 1 p.m. Friday. Grantsburg (31-5) will take on defending D-3 state champion Lake Country Lutheran (36-11) in the other semifinal, which is on an adjacent court at 1 p.m. The winners will clash for the Division 3 state title at 11:30 a.m. Saturday. After a crushing loss in last year’s state semifinals to Eau Claire Regis, in a match that the Tigers led 2-0 before Regis stormed back, Stratford came out determined to not let that happen again. A group of five seniors who played pivotal roles in last year’s state run have used that defeat as a catalyst for running through every and all opponents this season in effort to get a second chance at a state title. “The teamwork of the girls, they are always holding each other accountable for everything,” Stratford coach Brooke Kafka said. “They’re not going to let anyone settle for anything less than they are worth as a player, and together as a team. Seniors Mazie Nagel and Jadyn Dahlke earned unanimous all-Marawood Conference South Division honors this season, with fellow seniors Brooke Peterson and Blaire Lindner being named to the second team. Another senior, Callie Lehman, was an honorable mention choice. Junior Libero McKenna Krall was also a first-team choice and sophomore hitter Lauryn Nagel was a second-team selection. That strong core, led by the steady all-around play of Mazie Nagel, the team’s leading hitter, and Dahlke and Peterson, who are both setters and hitters depending on where they are on the court, have made the Tigers an unstoppable force. “From the experience we had last year at state, we’re ready to get a gold ball,” Dahlke said. “It makes you feel more comfortable. There’s no doubt in mind that if we play our game, we’ll be just fine. Last year, I feel like we were more nervous and excited, we had so many emotions going on. Getting back to the state tournament is just part of the puzzle for Stratford. The Tigers also know what it’s like to be at the Resch Center and what it will take to bring home a gold ball this time. Play begins in the 46th annual event with Division 1 quarterfinals on Thursday. Semifinals in all four divisions will be Friday, with the four championship matches on Saturday. The Division 1 quarterfinals and semifinals of all four divisions of the state tournament will be streamed live on the WIAA.TV portal of the NFHS Network on a consumer subscription basis. To purchase a subscription to the live programming, log-on to www.wiaa.tv and click on the “Subscribe” graphic. Archived streams of the games will be available on demand on the NFHS Network 72 hours after the tournament without requirement of a subscription. The finals will be streamed on Fox Sports app with cable system authentication. The four championship matches will be televised live on Fox Sports Wisconsin Plus and streamed on FoxSportsGo.com and the Fox Sports app. No. 1 Hartland Arrowhead (45-6) vs. Waukesha West (34-10), 4:30 p.m.
No. 4 Burlington (36-5) vs. Kimberly (33-10), 4:30 p.m.
No. 2 River Falls (42-2) vs. Greendale (31-16), 7 p.m.
No. 3 Oconomowoc (29-7) vs. Sun Prairie (40-8), 7 p.m.
Wausau Newman Catholic (31-12) vs. Burlington Catholic Central (37-7), 10 a.m.
Clayton (28-3) vs. River Ridge (24-0), 10 a.m.
Stratford (43-0) vs. Living Word Lutheran (29-6), 1 p.m.
Grantsburg (31-5) vs. Lake Country Lutheran (36-11), 1 p.m.
Little Chute (38-1) vs. Kettle Moraine Lutheran (30-10), 4 p.m.
Mosinee (37-6) vs. East Troy (29-8), 4 p.m.